jwilker: that's never good. Finde locked up. This is the error I got. What is -10810? This message doesn't seem very useful in helping solve the problem. One could do a Google search and weed through the over 10000 results. They would likely discover that others get this error for a variety of reasons with a variety of applications on a variety of versions of Mac operating systems. 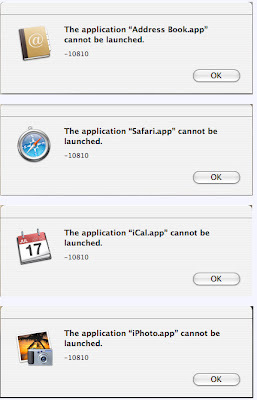 Don't know if it helps anyone, but I did find this article stating Finder.app -10810 errors in Snow Leopard may be related to accessing external drives.